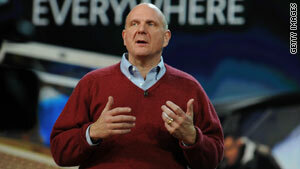 Microsoft CEO Steve Ballmer gave Thursday's keynote address at the Consumer Electronics Show in Las Vegas. Las Vegas, Nevada (CNN) -- Microsoft CEO Steve Ballmer opened up the largest consumer technology trade show in the world with a tone that was both reflective and energized, but without living up to much -- if any -- of the anticipation that preceded the speech. Some tech insiders had expected Microsoft to use its keynote slot Wednesday at the Consumer Electronics Show to debut a tablet-sized computer, a much-hyped category of electronics that is sized between mobile phones and laptops and usually has a touch-sensitive screen. Apple, the company's chief rival, is rumored to be announcing a tablet later in January. While Ballmer did briefly show off tablet-sized computers that run on Microsoft's Windows 7 operating system, he did not announce a Microsoft tablet computer; nor did he dazzle the technophile crowd with many new products or announcements. Instead, Ballmer chose largely to highlight the company's past successes, like Windows 7, the Xbox 360, its Zune HD portable music player and the search engine Bing. Thirty-nine million Xbox 360s have been sold worldwide, and Bing has gained 11 million new users in recent months, he said. He also mused on the history of technology and said he is going to be headstrong about the fact that the future will be just as innovative and inspiring as the past. Noting that the global middle class -- Microsoft's customer base -- is expected to jump from 1 billion to 4 billion people in coming decades, Ballmer said, "I'm bullish, and we can all be bullish in terms of the long-term prospects of our industry." A substantial portion of the keynote focused on entertainment and gaming, and some news did come out of that part of the talk. Microsoft announced Project Natal, a new controller-free video gaming system, which reads a players body movements with cameras and mimics them with avatars on screen, will be available for purchase by the holiday season this year. The company had demonstrated the system at another trade show last year, but had not set a release date until Wednesday. It is still unclear how much the system will cost, although Microsoft says Natal add-ons will work with its existing Xbox 360 gaming console. Robbie Bach, Microsoft's president for entertainment and devices, also announced a number of new games for the Xbox, including a new edition of the popular game Halo, which is due out in the spring. "What Star Wars is to film and what Harry Potter is to fantasy books, Halo is to the gaming industry," he said. Ballmer and Windows senior product manager Ryan Asdourian touted the success of Microsoft's Windows 7 operating system, which has won favorable reviews since it was released last year. Ballmer said the operating system has helped buoy PC sales in the down economy. Asdourian said the beauty of PCs is that there are so many to choose from -- from desktops to netbooks, notebooks and now tablets. "The great part about being a PC?" he asked. "You can find one that matches your style, your needs, and of course, your budget." Ballmer and Asdourian briefly showed off Windows-running tablet computers from HP, Pegatron and Asus. Ballmer referred to them by another name: "slate PCs." Some attendees said they left the speech disappointed. "We were really bored by it," said Paul Miller, an editor at a gadget-focused blog called Engadget. "This is CES, and you're looking for what's new. "For them to show us a bunch of products and functions that we'd already seen, it just seemed like a waste of time." Ben Parr, co-editor of the social media and tech blog Mashable, said he had expected more from Microsoft's keynote, but that the company did show off the fact that it had a good year in 2009. "It's still all very cool and Ballmer and company did a good job reminding us what sorts of things we'll expect in 2010," he said. At times in the keynote, Ballmer ruminated on the power technology has to transform peoples' lives. He mentioned several Microsoft research projects, including those to make health care data more useful for patients, to help researchers use software to find a vaccine for HIV/AIDS and to make homes more energy efficient. "All of us here tonight have a real responsibility to use technology for the betterment of the society and the betterment of the planet," Ballmer said in the address. Dylan Tweney, senior editor at Wired, said Microsoft doesn't get enough credit for its lofty and often-futuristic research goals. The problem, he said, as that these concepts don't always translate into better experiences for consumers. He also said Apple's rumored announcement of a tablet computer was hanging over Microsoft's talk. "Apple has been very smart in making inroads into home entertainment," he said, "and you could sort of see how somebody like Microsoft might look at the prospect of an Apple tablet and be very nervous."